Community Savings Bank will hold another of its popular “Customer Appreciation Days” at its main office on Friday, Oct.5th and Saturday, Oct.6th. The bank is taking this opportunity to thank its many customers for their patronage, and is also inviting neighbors and friends to join in the festivities. On Saturday, Oct. 6th, customers and non-customers will be given the opportunity to shred old checks, bank statements and other documents containing personal information. 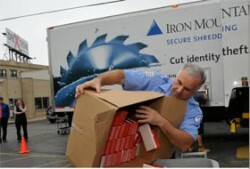 A mobile industrial shredder will be parked in the bank’s main parking lot from 9a.m., to noon for personal papers to be shredded on the spot. Community Savings Bank is a member of the FDIC and is an equal housing lender. The bank is located at 4801 W. Belmont Avenue, Chicago 60641. Telephone: 773-685-5300. Web: www.communitysavingsbank.com.